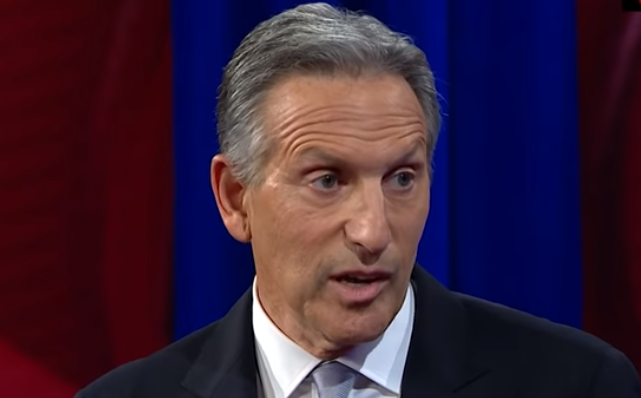 Potential 2020 presidential candidate Howard Schultz slammed Rep. Alexandria Ocasio-Cortez' "Green New Deal," which he called "unrealistic" and "immoral." "I read that by 2030 they're suggesting that every building in America becomes clean energy, conforms to clean energy, just to put that in perspective, because it's not realistic, that would mean that between 2,000 and 3,000 buildings a day would have to be reconstructed to conform to what they're saying," Schultz said. "So let's be sensible about what we're suggesting." Schultz, a spoiler candidate who pledged to drop out if it becomes clear he wouldn't be able to win the 2020 election, also knocked grandiose job guarantees in the Green New Deal. "I don't understand how you're going to give a job for everybody, how you're going to give free college to everybody, how you're going to create clean energy throughout the country in every building of the land," he said. "I think it's immoral to suggest that we can tally up $20, $30, $40, $50 trillion of debt to solve a problem that could be solved in a different way." On Tuesday, Senate Majority Leader Mitch McConnell (R-KY) had some fun - rushing the "Green New Deal" resolution up for a vote in the Senate, forcing some Democrats to take a position on the controversial legislation. Schultz also told the CNN town hall audience that he doesn't see color. "As somebody who grew up in a very diverse background as a young boy in the projects, I didn't see color as a young boy and I honestly don't see color now," said the billionaire, responding to an audience question about an April 2018 racial profiling incident which took place in a Philadelphia Starbucks store after the manager called police on two black men who were waiting for a friend. "Injustice in America of any kind -- especially racial injustice, which continues -- is not something that we should be proud of and we need to resolve," said Schultz, when asked if he thought the incident would be an issue for voters, adding that the Philadelphia incident was "something that we learned a great deal from," adding "We realized that we had a problem. And it's a problem that I think exists widely in this country, and it's something that I would characterize as unconscious bias that many of us have based on our own life experiences." "We have to be able to have uncomfortable conversations. We have to talk to people who are different than ourselves," said Schultz. "We have to embrace the diversity of the nation."